Sketch with Asia is the first major publication from online manga-inspired art phenomenon, Asia Ladowska. Asia blends her talent for hyper-realism with her passion for manga, creating the distinctive artistic style she is well-loved and recognized for. 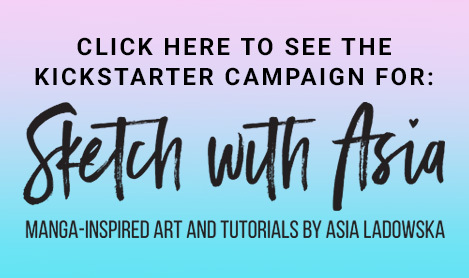 Further to her regular and inspirational #SketchwithAsia challenge on Instagram (where she has over 900k followers), now explore this beautifully presented 168 page art book to discover an even more detailed exploration of Asia’s processes as she creates her art. From faces and expressions, to hair, hands, and more, learn how she draws both traditionally or digitally, and how she so successfully employs colored markers and pencils to complete her art. The fascinating book also includes a collection of Asia's finished artwork, including exciting pieces created especially for this publication. Presented in an entertaining and easy-to-read way, this book is a unique resource for fans of manga, for fans of Asia herself, and for any aspiring artist sharing their art in a modern world.